Pope Francis shakes hands with Ivan Abrahams, general secretary of the World Methodist Council, during an audience at the Vatican Oct. 19. Members of the World Methodist Council were in Rome to commemorate the 50th anniversary of the formation of the Joint International Methodist-Catholic Dialogue Commission. (CNS photo/L'Osservatore Romano) See POPE-CATHOLICS-METHODISTS Oct. 19, 2017. VATICAN CITY (CNS) — Catholics and Methodists can strengthen each other through a shared witness of faith, especially through acts of love toward the poor and the marginalized, Pope Francis said. The mutual call to holiness shared by both communities “is necessarily a call to communion with others, too,” the pope said Oct. 19. “When, as Catholics and Methodists, we join in assisting and comforting the weak and the marginalized — those who in the midst of our societies feel distant, foreign and alienated — we are responding to the Lord’s summons,” he said. 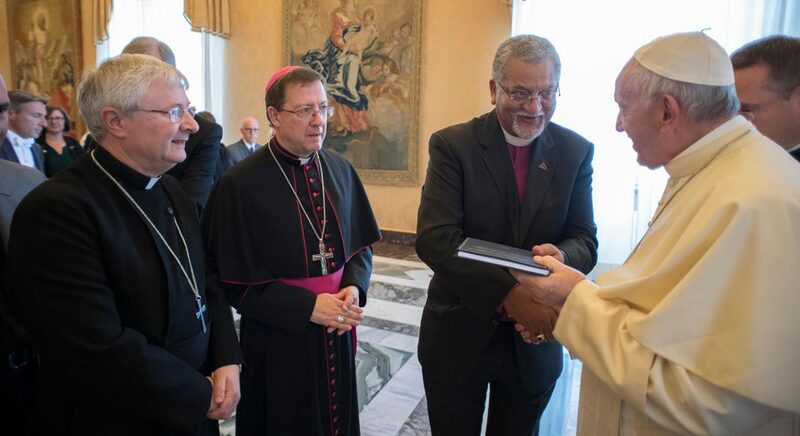 The pope met at the Vatican with members of the World Methodist Council who were in Rome to commemorate the 50th anniversary of the formation of the Joint International Methodist-Catholic Dialogue Commission. Welcoming the delegation members, the pope said that in the Bible, the 50th year is a significant moment for the people of Israel in which liberty is proclaimed throughout the land. “We are grateful to God because we can say that, in a certain sense, we too have been freed from the slavery of estrangement and mutual suspicion,” he said. “We are brothers and sisters who, following a long separation, are happy once more to see and learn about one another, and to move forward with open hearts,” he said.